Online you must write proper, like, you-know-what-I-mean, init? Online you can find a variety of linguistic approaches from the formal, academic approach right through to slang and “text speak”. 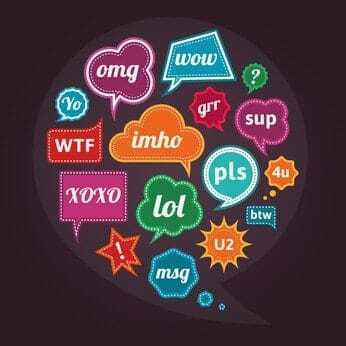 On social networks, in particular, there is a trend for people to use short forms, abbreviations and “online speak” instead of what you might call “everyday” language. Indeed, many people resort to abbreviated speech on Twitter, for instance, because of the limitation of the space available. However, the way we say things online appears to influence what people think about us. Even if we think that “everyone knows” that we are using “text speak” for convenience and that none of us really speak like that, it turns out that using such language does impact on our reputations. In a study at the University of the West of Scotland researchers found that non-grammatical speech used on Facebook reduced perceptions of the individual. The research demonstrated that when people did not spell correctly, when they used “text speak” and when they were otherwise grammatically incorrect in Facebook postings their perceived employability went down. Furthermore the people were seen as less competent and less intelligent than those who did use “correct English”. In order to check that the participants were not basing their judgements on some other aspect of the Facebook user, the study also checked for perceived attractiveness. There was no relationship between the low-level language and the attractiveness ratings of the people, indicating that it is the words alone that seem to have a special meaning about how we perceive someone online. What does this all mean for businesses online? It suggests that you need to “write proper”. Allowing your staff to blog using poor language, however “modern”, appears to have consequences. The use of improper language on social media also has an impact. Staff members using colloquial language online could well have an effect on how they – and your business – are perceived. It all implies that each business should have a “style guide” on the language to use and the way to write online. Many firms have social media policies – but these cover things like security and issues surrounding what is acceptable generally. Few businesses seem to have guidance on “how” to write online – it seems that it is assumed people can write. Yet, many people cannot. Online communication is focused on the written word and it is these written words which are central to the impression conveyed about your company. Yet, how much training has there been in your business in terms of writing skills? Writing is the number one thing people do online – but writing is rarely taught beyond school. Businesses assume their staff can write. Is that a fair assumption?